YANGON—A recent U.S. report portrays China as seeking privileged access and influence inside Myanmar in order to further its geostrategic interests, while taking steps to counter the influence of Western countries—particularly the U.S.—especially along the China-Myanmar border. In its report “China’s Role in Myanmar’s Internal Conflicts”, the United States Institute of Peace (USIP) mentions that a Chinese ambassador to Myanmar told his U.S. counterpart not to go to conflict-torn northern and eastern Myanmar, where China wields influence over ethnic armed organizations (EAOs). She did not deny the existence of the statement cited in the report, however; nor would she identify the U.S. ambassador to whom it was addressed. However, the ambassador in question is likely Derek Mitchell, who was posted in Myanmar until March 2016 and was the predecessor to current U.S. Ambassador Scot Marciel. Mitchell, formerly one of the U.S.’s most senior diplomats, also co-chairs USIP’s China-Myanmar Senior Study Group. Meanwhile, the “newly arrived PRC ambassador” may be Hong Liang, who has been Beijing’s envoy to Myanmar since July 2015. In 2012, Mitchell became the first U.S. ambassador posted to Myanmar after two decades of low-level bilateral relations. Five months after his arrival in Yangon, he made his first official trip to Kachin State, where fighting between government troops and the ethnic Kachin Independence Army (KIA) was raging, to learn how the U.S. might help refugees there. He would make at least two more trips to the state, which shares a border with China. Then-U.S. 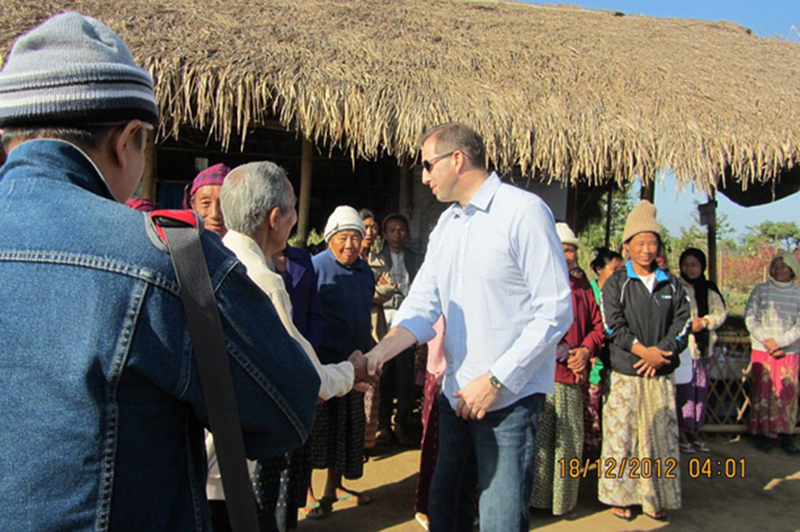 Ambassador Derek Mitchell visits Kachin State in December 2012. On the other hand, with several clear strategic interests in Myanmar—ranging from stability on its shared border to access to the Indian Ocean to a wide variety of economic interests—Beijing has been playing a key role in Naypyitaw’s internal security affairs and in peace negotiations with ethnic armed groups. It has both a direct and indirect influence on the dynamics of conflict and peace in northern Myanmar. Beijing supports the Myanmar government and its peace process, but at the same time provides shelter, weapons, and other assistance to some of the ethnic armed organizations, according to the USIP report. Until recently, China had been worried about a possible deterioration in relations with Myanmar under the government led by State Counselor Daw Aung San Suu Kyi, given her longstanding ties to the West. This concern has eased of late, however, as Western governments become increasingly critical of her silence on the Rohingya crisis, while China has shielded Myanmar from international condemnation over the issue at the U.N. Despite the ongoing peace process initiated by the previous government, several ethnic armed groups including the KIA, the United Wa State Army and the Ta’ang National Liberation Army (TNLA) have refused to joined the government’s Nationwide Ceasefire Agreement (NCA). Most of the non-signatories are from the northern border with China, in particular Kachin and northern Shan states. 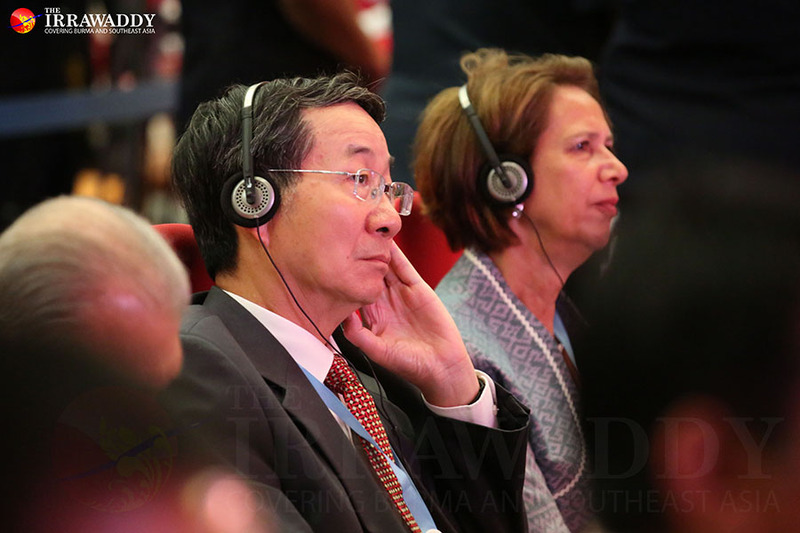 Chinese Special Envoy Sun Guo-xiang has urged the EAOs to attend the government’s peace conferences, including groups still engaged in fighting with the Myanmar military (or Tatmadaw) and who oppose the NCA. In May 2017 and July this year, Sun flew members of non-signatory groups from Kunming, China to Naypyitaw on a chartered Chinese plane. Many representatives of the EAOs said they attended solely because China pressured them to do so, according to the USIP report. To secure its interests, China is attempting to apply pressure not on the U.S. but on the EAOs. Brigadier-General Tar Bone Kyaw, the general secretary of the TNLA, a non-signatory to the NCA, said the group had held frequent meetings with Sun. During the meetings, he said, the Chinese special envoy stressed border stability and Myanmar’s importance to the success of Beijing’s Belt and Road Initiative, while discouraging ethnic armed groups from putting much hope in the West’s involvement in the peace process. “He pressured us to have nothing to do with the West if possible. He urged us to join Panglong [the government’s ongoing peace conference] in a positive manner and get along with the government as best as we can,” Brig-Gen. Tar Bone Kyaw said. Myanmar’s peace process also receives support from the wider international community, however. The Joint Peace Fund (JPF), set up by mainly Western donors including the U.S. to support peace in Myanmar, takes a holistic approach, supporting a broad range of stakeholders and projects at all levels of society. These donors have collectively pledged just over USD100 million to be disbursed through 2021. While Chinese involvement in Myanmar’s peace process has focused on border stability, as well as economic and geostrategic interests, the U.S.’s approach seems more holistic with a focus on humanitarian aid, and nationwide peace building based on a culture of dialogue aimed at an inclusive, sustainable end to armed conflict. According to a U.S. Embassy statement issued in November last year, Washington has provided over USD60 million since 2012 to deepen and sustain reform, and to foster legitimate and inclusive peace building nationally, including support to diverse civil society groups. Ambassador Marciel has visited Kachin State at least twice, most recently in February this year to meet war victims and civil society organizations as part of the U.S. support for the peace process, according to media reports at the time. The USIP report recommends the U.S. government encourage Beijing to be more transparent about its peace strategy and engagement with various players, including the EAOs along its border. “In the process, China should avoid any actions or policies that obstruct or inhibit furtherance of peace inside Myanmar due to narrow consideration of its own national interests,” it said.